Tampa, FL, May 25, 2017 – TeamViewer®, a leading global software provider for digital networking and collaboration, today announces a new feature that has been added to ITbrain, TeamViewer’s efficient IT-Management solution: The new Remote Task Manager will save IT support teams time by allowing users to view and manage running processes and services of a device without having to remotely access that machine. ITbrain’s new Remote Task Manager is a web-based console that conveniently facilitates the daily business of help desk agents, supporters, and IT administrators. For example: IT helpdesk staff at a Managed Service Provider may receive a call from a customer because of a software application that is no longer responding. 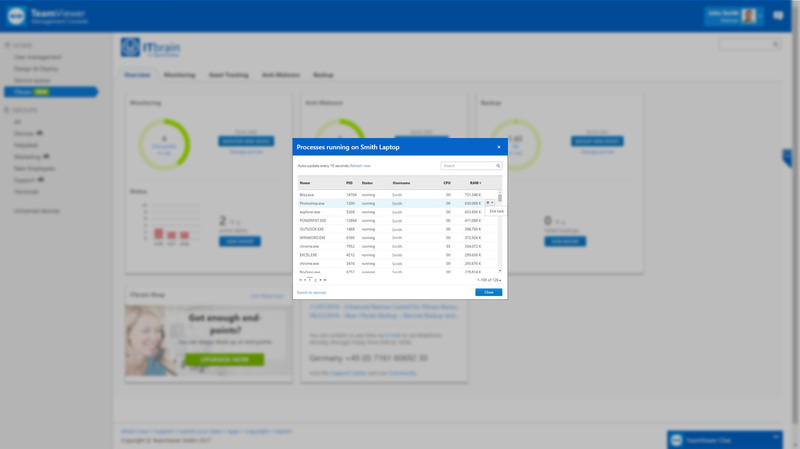 With the new Remote Task Manager, IT helpdesk staff can effortlessly have a look, identify the error, and stop the underlying process so that the customer can re-start the application without any issues. They can do all of this without even remotely accessing the machine in question. ITbrain is a cloud-based IT management solution for businesses. It provides users with monitoring, asset tracking, anti-malware, and backup capabilities. Developed by TeamViewer, ITbrain is completely integrated into the TeamViewer experience and provides a proactive support tool for IT support teams. It lets teams create individual policies and take preventative action before users even notice an issue with their device. ITbrain also helps businesses to make cost savings by centrally accounting IT systems, reduce downtime, prevent data loss and drive savings through proactively managing the IT function.